How Do You Spell ELSIE? Correct spelling for the English word "Elsie" is [ˈɛlsi], [ˈɛlsi], [ˈɛ_l_s_i]] (IPA phonetic alphabet). 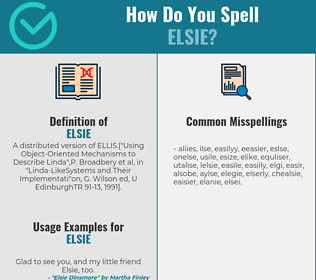 Below is the list of 200 misspellings for the word "elsie". A distributed version of ELLIS. ["Using Object-Oriented Mechanisms to Describe Linda",P. Broadbery et al, in "Linda-LikeSystems and Their Implementati"on, G. Wilson ed, U EdinburghTR 91-13, 1991].